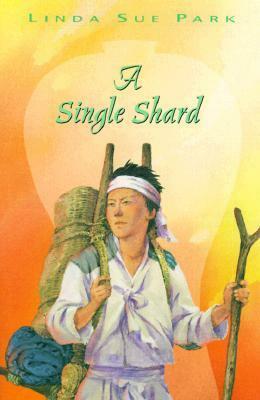 A Single Shard is set in Korea, in the 12th Century. Tree-ear, a young boy, and Crane-man, an older man with a deformed foot, are unusual in their small village of Ch'ulp'o in that they are homeless and make their dwelling beneath a bridge. Though they are not related by blood (Tree-ear does not know anything about his parents), they are family to each other, as they work each day to earn enough to eat in whatever way they can. Though he is poor and therefore unlikely to be apprenticed, Tree-ear's true passion is for pottery, and when he has spare time, he sneaks off to admire the work of Potter Min, a meticulous artist with a sad life story. When Tree-ear breaks something belonging to Min, the potter becomes furious, to the point that Tree-ear offers to work for him to repay his debt. Though the work is mainly drudgery, Tree-ear holds out hope that he will one day be allowed near the wheel himself. The characters in A Single Shard, though few, are quite well-developed. The central friendship between Tree-ear and Crane-man provides an emotional core to the story that shapes the reader's feelings for Tree-ear and hope for his success. The slow reveal of information surrounding the tragedy that has struck Min's life is also very effective, and it enables the reader to feel Tree-ear's growing sense of affection for the potter and his wife. The kindness of the potter's wife, too, is notable, and she, of all the characters, makes an excellent role model for showing true charity to other human beings without asking for anything in return. Interestingly, this is yet another historical fiction novel in which a character has a disability, the third I have read recently where the affliction is a deformed limb, and the second where the injury is to the foot. In Thieves of Ostia, Lupus is mute because his tongue has been cut from his mouth. In The Last Girls of Pompeii, Julia's parents want to send her away because of a withered arm. In Shadow Spinner, Marjan has a crippled foot that limits her ability to marry or find work. While I wonder how prevalent these conditions actually were during the time periods represented by these books, I do think it is interesting that the authors chose to include them, and to portray the ways these characters were ostracized and stigmatized for being different. For elementary and middle school kids, these characters present opportunities to consider the injustices imposed by different societies and to think about how our current culture's treatment of the disabled is the same or different. Included as a preface in my copy of this book is Linda Sue Park's Newbery Medal acceptance speech. In it, she explains the inspiration for the book - a real piece of pottery from this time period which is decorated with cranes. For kids who feel that historical fiction is too far removed from real life, or who have a hard time connecting to books set in the distant past, having this connection to a real object might help them engage more with a story they would otherwise ignore. I also think that writing the backstory for a real object - historical or not - is a great exercise and a perfect writing assignment to accompany a literature study of this book. A Single Shard is a powerful, emotional, and exciting read about a time period and setting not often represented in children's fiction. It makes an excellent complement to a study on Korean history, especially thanks to the historical details given in the author's note, but it works just as well as a novel to read for enjoyment.